Ecuador’s new President Lenin Moreno has taken office, pledging to continue the left-wing policies of his predecessor Rafael Correa. In his inaugural speech, he promised more subsidies for the poor and a major social house-building programme which would create millions of jobs. But he also said he would streamline government administration costs. Mr Moreno won April’s closely contested presidential election, beating his conservative rival Guillermo Lasso. “I am a president for all. I owe this to everyone. 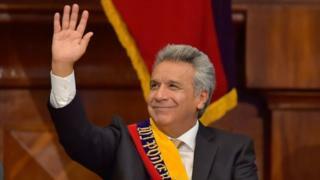 I respect everyone,” President Moreno aid on Wednesday in the capital, Quito. Correspondents say Mr Moreno faces a tough job, as oil-rich Ecuador has suffered from the fall in global prices, and the country has mounting debts.